Autonomous robots will soon patrol in neighbourhoods, while drones are now helping to nab criminals. An autonomous car with large wheels, and bearing the police stripes, zips past pedestrians in a neighbourhood. The patrol robot is the newest addition to the Singapore Police Force, keeping a watch on all that it sees and hears. While these robots happen to look like the loveable Wall-E robot, they can hunt down criminals with the efficiency of RoboCop. 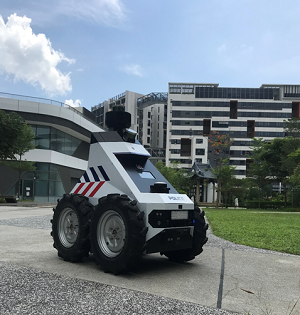 The patrol robots are the brainchild of officers at the Ministry of Home Affairs (MHA), Portia Loh, Senior Assistant Director at the ministry’s Science and Tech Strategy Office, told GovInsider. The ministry is building a task force of robots to patrol and survey suspicious activity in neighbourhoods. The goal is for the robots to form a “network of cooperative surveillance”, she said. The patrol robots, also known as the outdoor robotics surveillance system (ORSS), will complement the patrol work of real police officers, leaving more time for officers to work on other tasks. They “free up manpower to handle more critical tasks”, Loh remarked. The Ministry won an award for the Best Drones and Robotics Project at the GovInsider Innovation Awards this year. The robots contain cameras that transmit a 360-degree live video feed to a police command post, so that officers can reach the scene of crime when a robot identifies suspicious activity. Another function of these robots is to “identify sound anomalies, including screams, gunshots and drones”, Loh said. MHA is equipping each robot with advanced sensors and intelligent autonomous navigation and mapping algorithms, which allow them to easily detect and avoid obstacles. Earlier this year, the patrol robots were first deployed to patrol at the 2018 Chingay parade. Currently, the ministry and the police force are conducting operational trials with the patrol robots to test their navigation, detection and tracking capabilities as well as as response times. “Subsequent improvements would be made from the gathered trial data to further improve the performance of the ORSS,” Loh added. Meanwhile, MHA is using drones to monitor search and rescue operations, hostage and emergency situations by air. These drones “conduct aerial surveillance for forested operations, fire management and crowd monitoring for mass participation events such as New Year’s Eve Countdown,” said Ng Chee Koon, Assistant Director of the Tech Futures Directorate at the ministry’s Ops-Tech Group. The drones are equipped with high-definition cameras that transmit clear images of people and objects on the ground. Meanwhile, its thermal-imaging capabilities allow police to identify human heat signatures – a boon for nabbing criminals in densely-forested areas, especially at night. Since December 2016, the drones have helped the police to nab three criminals “conducting illegal activities in the forest”, said Ng, and have monitored major fires, pipelines, and even traffic congestions at checkpoints. Earlier in October, police officers caught 125 illegal immigrants via night-time drone operations in the western and northern parts of Singapore, the Straits Times reported. The success of these projects will crucially depend on ensuring that field officers and residents don’t feel threatened by them. Perhaps a lesson from Wall-E could help.